Mirror Surface Polishing Machine For Stainless Steel Sheet (SAM-4) - Yang Hsiang Precision Machinery Co., Ltd. 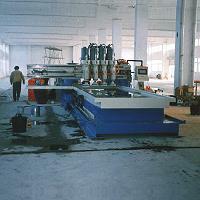 It can grind the sheet with one or two or more grind heads depend on the work piece width. We develop many type of this kind machine like one arm, four head, 12 heads or PLC program control could be choice by customer needs (you must supply cutting fluid into the shaft). The grind shaft's motion divide two stage and the revolution could be choice. The pressure on the sheet could be adjust by the pressure adjuster. We develop new "rotary joint" on the top of each shaft. New development type & 2 shaft with conveyor type is new brand this year.